This website is an extension of the Free Range Ukulele Society of Oak Park Meetup Meetup.com/Free-Range-Ukulele-Society-of-Oak-Park website. The Free Range Ukulele Society of Oak Park (FRUSOP) Meetup† brings together people who love to play—or want to learn to play—the ukulele, to sing, and to have fun. We love our Meetup.com site, however—although there are many good reasons why they should—we do not require meetup participants to be members of Meetup. Heck, if you like to sing and have fun, participants aren't even required to have ukuleles. “Well, that sounds exciting,” we hear you say. “When and where does this happen?” We meetup every Thursday at 7:00 p.m., except holidays and when our venue is having a special event. Our hosting venue is the Eastgate Café (EastgateCafe.net) in the Oak Park Arts District102 Harrison Street, Oak Park, Illinois, who generously provides their dining room to us without charge. We sing songs found in that week's song-sheet packet. Food and beverages are available for purchase from our hosting venue. No one who organizes the meetup gets paid, however we do request a suggested donation of $5.00 to help us with our costs. The meetup we had on Thursday, September 24th, 2015, was significant. Find out why. Also the meetup we had on Thursday, September 14th, 2017. And read how we acknowledged that the meetup we had on Thursday, October 11, 2018, was an important landmark. BTW, we take no official stand on whether the dress is White and Gold, or Blue and Black. 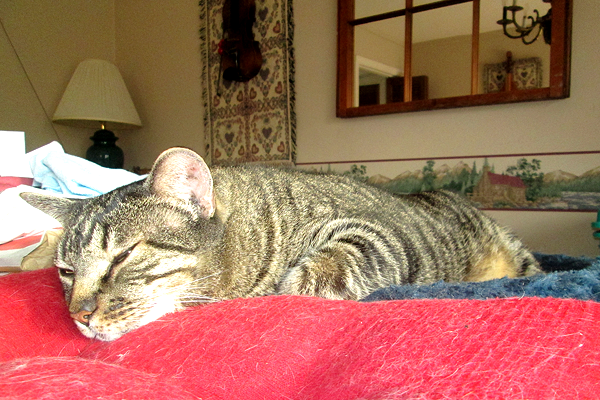 Your cat will be lulled to sleep when you play your ukulele. Ukuleles are very therapeutic. 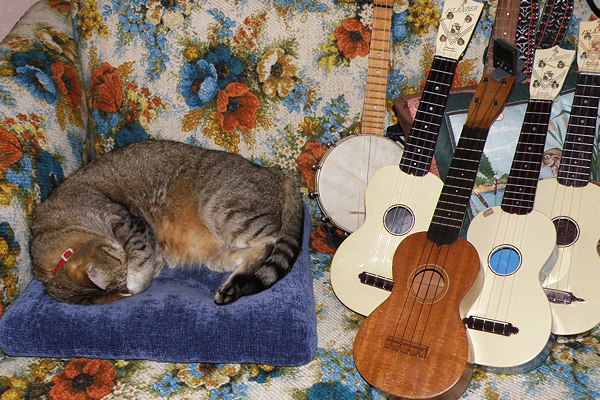 That means your cat will feel safer when it has a flock of ukuleles nearby. 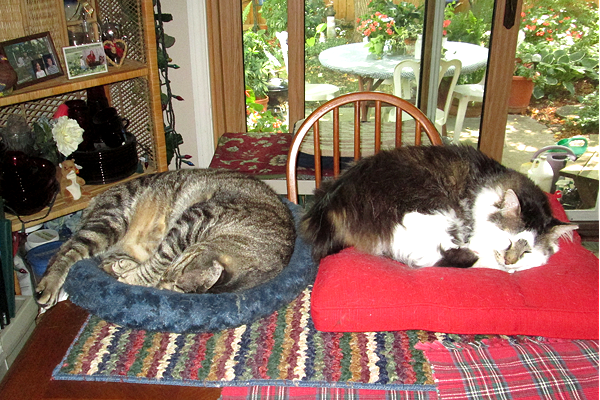 The only thing this picture has to do with ukuleles is that these cats were sleeping in the home of two ukulele players. Or is that two ukulele players live in the home these cats rule?